FREE SHIPPING UPS Ground to the lower 48 states for on-line orders only. "JJ and A Racing Products" built our first Outboard Bearing Style Axle Assembly for Dennis Packard at Packard Enterprises in February of 2005. 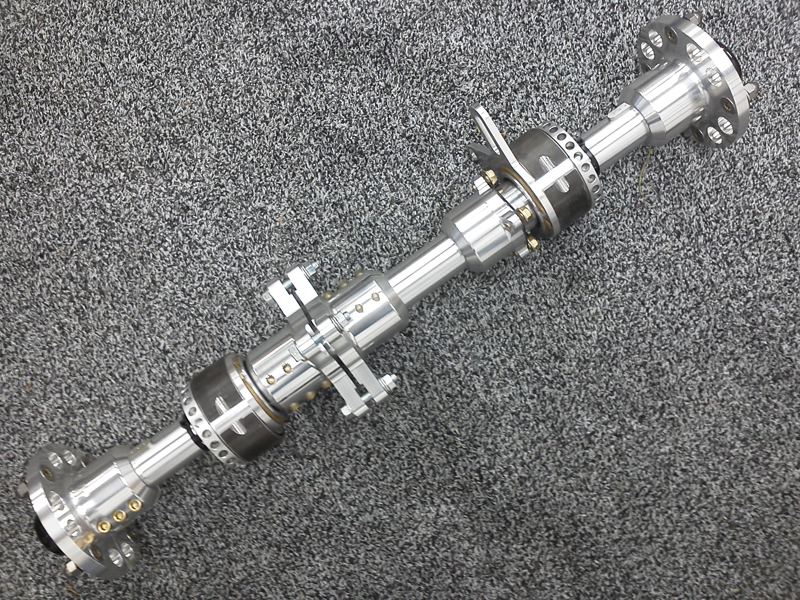 We have since made our Outboard Bearing Style Axle into an available "Kit" for rigid frame builders. 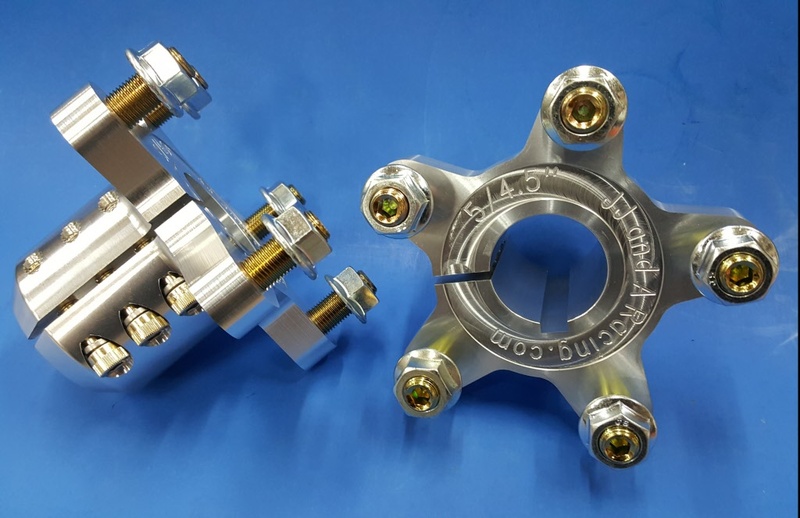 This axle assembly is designed for the ultimate drag ATV. There is over 6" of Sprocket Hub clamping surface and Drive Key length. 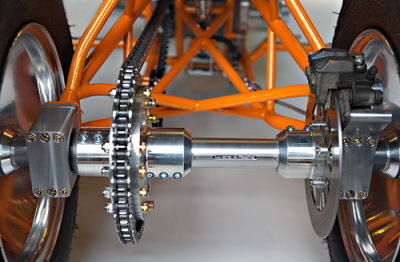 This axle kit is not for the "un-ambitious"... the engine placement and frame tail section must be designed in conjunction with the axle assembly. 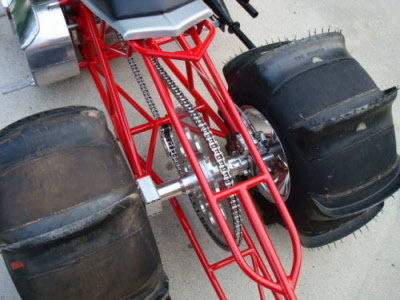 The sprocket location is quite flexible since there is no carrier in the middle of the axle. One more axle product from JJ and A Racing with unique design features for the CNC "pirate shops" to copy! On our own two-cylinder Banshee powered shop bike, we left the motor and the rear sprocket location unchanged. On a triple-cylinder Banshee application, you may want to move the motor and the rear sprocket to the right a couple inches... just let us know. On this customer's triple-cylinder Sno-Mo powered bike which uses a jack-shaft system behind the motor, we set the sprocket in the very center of the axle shaft. 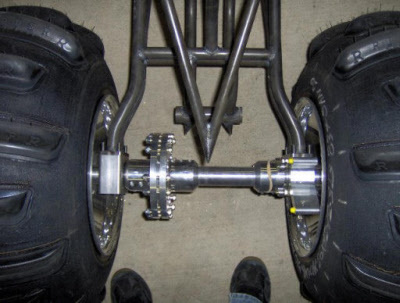 Here's another customer's new Outboard Bearing Style Axle in his custom-built "in-process" rigid drag frame. 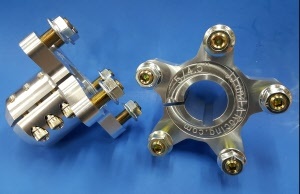 A billet aluminum CNC machined block holds a 48mm wide sealed bearing pack next to each rear wheel. Chain slack and axle shaft flex are virtually eliminated. Your drag frame is going to go STRAIGHT down the track. We have designed the rotor side bearing block to directly accept a Banshee brake caliper. Plated grade-8 metric fasteners are supplied for mounting caliper and rotor. Your #530 sprocket is "sandwiched" between two 12-bolt (Banshee 6-bolt pattern repeated) sprocket hubs. Plated grade-8 metric fasteners are supplied. The two sprocket hubs have a total of six pinch bolts clamping them to the shaft. just give us a call !! The 7075-T6 axle shaft is 40mm diameter. The wheel hubs are Yamaha 4/115 bolt pattern with 3 pinch bolts per hub. Kit comes complete with two chromoly tailplates to be welded to the rear of the frame. The tailplates are tapped for the bearing blocks to bolt directly to the back of the frame. Chain adjustment is maintained by simply sliding a 1/16" incremental aluminum shim in front of each bearing block. A complete set of slide-in shims are supplied with kit. 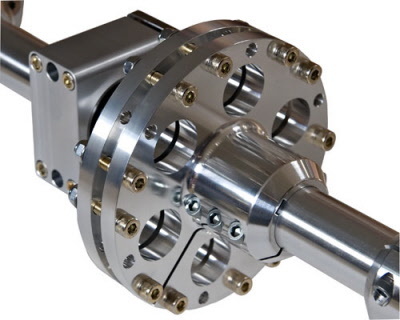 Our outboard bearing style axle assemblies are for competition drag race use only. 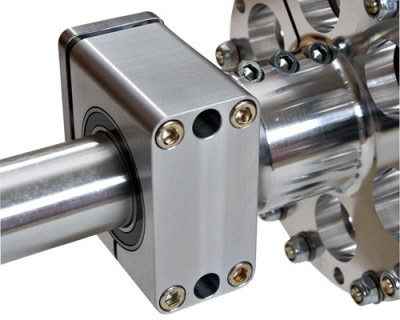 There is no warranty on any of the components of our outboard bearing style axles. FREE SHIPPING UPS Ground to the lower 48 states for on-line orders. An alignment pin is needed to correctly set the line-bore of the blocks when welding the chromoly tailplates to each frame. 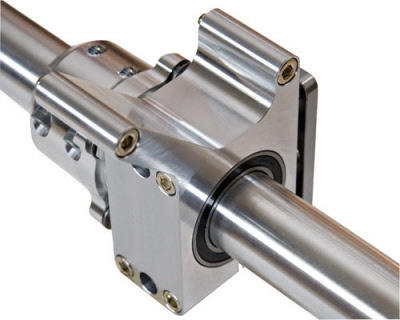 We suggest using our 62mm diameter solid T6 aluminum "Pin" to insure alignment. The billet pin is 28-1/2" long.